The performance seems about the same, but the sound was not quite as good as the stock muffler (gutted) – and it was louder. I doubled the size of the aftermarket baffle and it improved the tone to where I don’t mind it, but it seems to sound “harder” than the stock muffler, whereas the stock gutted muffler assembly had a smoother, more powerful, more pleasant sound – at 65 to 70, the sound reminded me of a Moto Guzzi. It still sounds “good” – but the stock muffler sounded better. 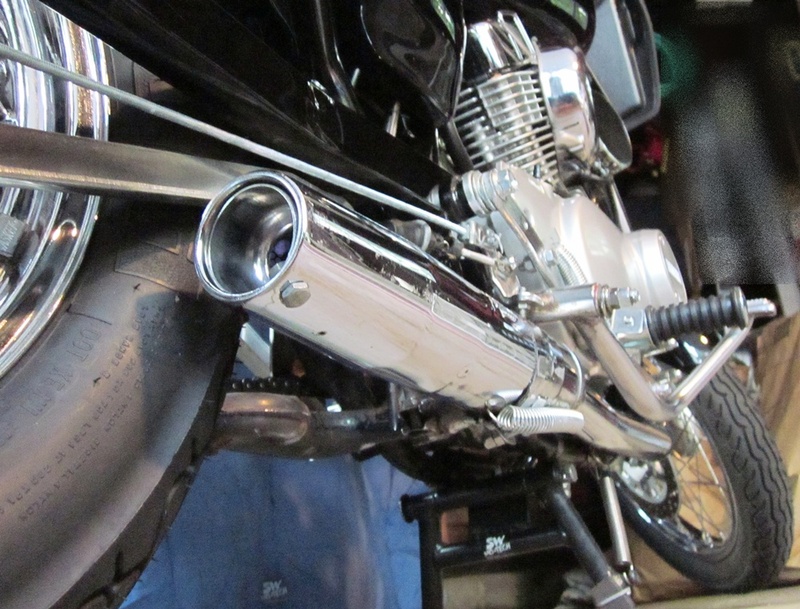 Please see my later post – http://wp.me/p1LWaM-2T The cheap Virago 250 “2-to-1” exhaust mod Part II – you need one used Supertrapp muffler – reduces exhaust system weight from 6.2kg (13.6 pounds) to 4.3 kg (9.5 pounds) -Les S.
This entry was posted in Motorcycles and tagged baffles, baffles muffler, V-Star 250, Virago 250, Virago 250 exhaust mods, Virago 250 muffler mod, XV250, XV250 exhaust mods. Bookmark the permalink. Let me know how your new pipes do. thanks for the reply. i was also thinking about along the lines of putting the bike on top of some boards like what you suggested. from the way it looks, i would have to remove the ignition switch and the fake pipe bracket to reach the bolts for the rear header. my bike is essentially pure stock with a few cosmetic changes and air filter. she had about 19k km when i got her, 1990 model. she now has 25k km. the pipes will be my first major mod. hopefully there wont be any issues. I just notice today that I have a exhaust problem. The problem is that the smoke is not coming out from the exhaust pipe at all, but it’s coming from under the rear wheel. It looks like that lower plastic pipe is connecting to the exhaust pipe and I think there are wholes in it, maybe cracked. Do you know where I can get that part? It’s expensive? Or I can just re-modify and add aftermarket pipes? Maybe home made? I can see the plastic pipe is going up all the way to the seat. I don’t have a drawing, so I’m not sure where the exhaust pipe is going and coming from. 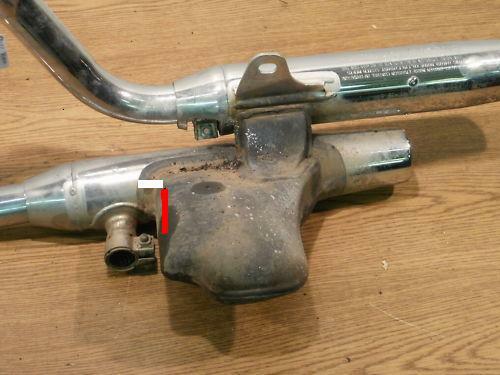 The 250 is a v-twin, so the first exhaust connection pipe is in the front, what about the second? Can I just join them together and have one exhaust and remove that lower plastic piece. The lower plastic piece exhaust pipe looks likes it’s emission installed to reduce pollution. 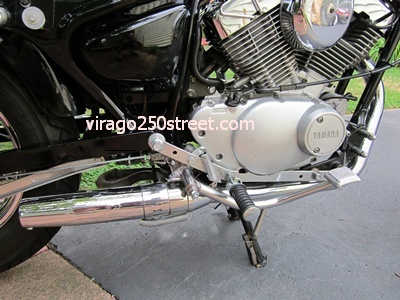 Please search google for “virago 250 rear exhaust” and view the images, Does the black rear exhaust on your bike seem to look OK compared to the google images? 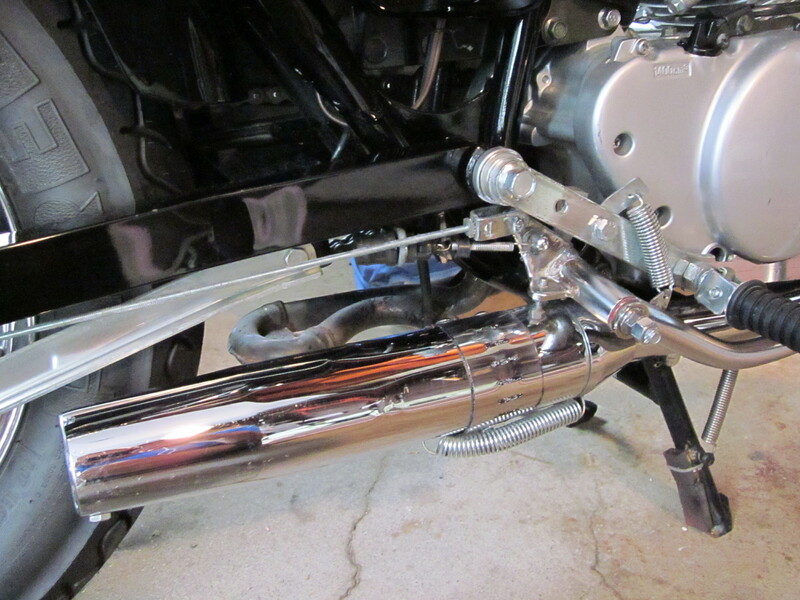 Could you take a closeup photo of the rear exhaust (under the bike) and send that ? Thanks, Les S.
Searching on Google I think the problem is from the muffler. I’m planing to take the pipes down this weekend and check the exhaust pipes and the muffler. I think the muffler cracked when I lifted the bike up on the jack (wide stand) I bought from eBay. I shouldn’t have lifted the bike under the muffler. I wish I could get a center stand that would be easier to lift the back tier and work on the motorcycle. Looking at the second cylinder and where the exhaust pipe connects it looks all good, in good condition, not corroded or rust. My 2009 v star 250 has 4,900 miles. I do hope it’s not the muffler, because if it is that will be an expensive repair, I saw over $435 for the entire exhaust pipe, because it’s included with the muffler. Of course unles I can find a used one on eBay. 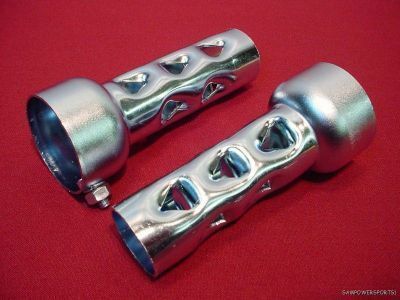 I will send you a picture when I get the exhaust pipes off from both cylinders.